The power company plans to reduce emissions by 40 per cent from 2005 levels by 2030. By that year, it wants to have added an additional 1,600 megawatts of wind power. The Crown has stated a goal of reducing greenhouse gas emissions by about 40 per cent from 2005 levels by 2030. SaskPower says it will rely on power generated by wind to achieve its goal of reducing greenhouse gas emissions. To put that into perspective, at 2:15 p.m. CST on Wednesday the entire province was using 2,700 megawatts. That means the 1,600 megawatts of wind would cover about 60 per cent of the power needs at that moment. However, there are just 225 megawatts of wind power installed in the province right now. 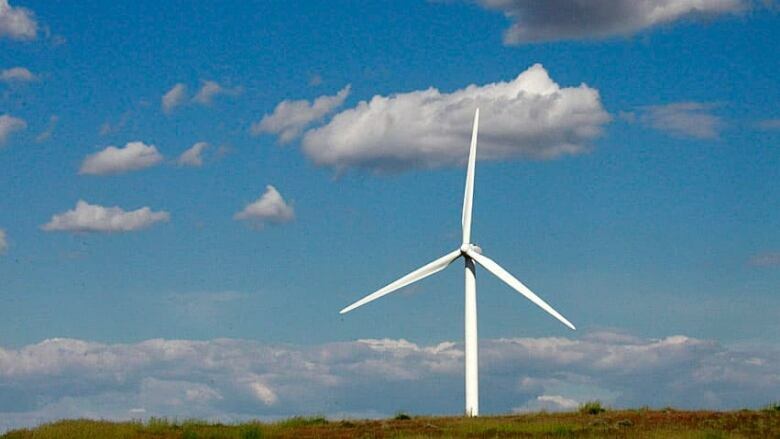 Wind power project proposed in Blue Hills, Sask. The new Blue Hills wind farm will produce 177 megawatts, and there is a 200-megawatt project that would draw from small, independent power producers. "By the year 2019 through 2020, we'll be adding another 375 [megawatts] on top of the 225 that we have," SaskPower president Mike Marsh said, speculating the next project could be around 200 or 400 megawatts. Gord Wyant, the minister responsible for SaskPower, said that while the numbers might seem small they are "significant" when compared to the bigger picture. Saskatchewan's overall power grid capacity is 4,700 megawatts. "So, when we start talking about the potential of 1,600 megawatts of wind, that's a significant component in terms of our overall strategy," Wyant said. Marsh added that it's not about speed when it comes to the renewable shift. "The pathway that we've chosen allows the province flexibility. It allows us to add wind generation as our capacity continues to grow, but add it at the right time," he said. "This minimizes rate increases and provides for us to move down that path to that cleaner energy future." NDP critic for SaskPower Carla Beck said she's not confident the province will meet its 2030 goal. "I'm glad to see that there's an investment in renewable, but it's coming rather late," she said. She also cautioned against rate increases, saying that would come at a time when people are under struggling with other increases to provincial taxes. SaskPower customers should expect to see more rate increases, probably for the year 2018, Marsh said. SaskPower raked in $46 million in profit in the last fiscal year, up from $26 million for the 15-month period from January 2015 to March 2016. The projected net income for this year is expected to jump to around $180 million because of recent rate hikes. SaskPower plans to use that extra money to tackle its debt and for capital expenses. The Crown​ put nearly $1 billion into the province's electricity system in the 2016-17 fiscal year, according to its annual report. Those dollars went towards the aging power grid, growing demands and environmental commitment. The annual report also highlighted a potential "utility scale" solar project, that — if built—could be the first Canadian project of that scale outside of Ontario.